Oil on cardboard, 26 x 35 cm. 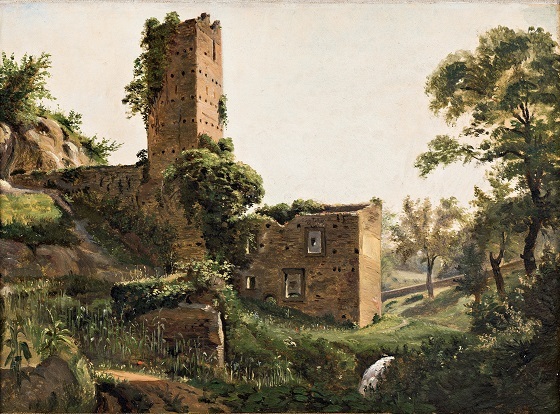 On his arrival at Rome, Wilhelm Marstrand found it difficult to start painting. In search of inspiration, he ventured into the mountains outside the city on his own to paint studies for an altarpiece. This landscape painting was probably completed during that trip. With its decorative qualities, the painting would be a fitting background for a religious work. With a few swift brush strokes, the artist has created an image of lush vegetation in the foreground, its shining surface highlighted by the intense Mediterranean sunlight. Further in the background, nature has begun its slow process to reclaim a ruin in the hilly landscape. The picturesque depiction of the scenery and ruin suggests an influence by the French artist Clause Lorrain and his Italian landscape paintings.